The woman who runs the blog is an on-fire-for-the-Lord type who tried, with her husband, to join one of Mars Hill’s new spin-off churches. They were frustrated by what they saw as demagoguery and poor leadership by the young, inexperienced men running the community groups: “EVERYTHING,” she writes, “always comes back to DOCTRINE, not JESUS.” Eventually, the couple left. Even though they had not become full-blown members, their community-group leader demanded an explanation from the husband anyway. When the husband said, in essence, it’s none of your business, he says the group leader questioned his faith in Jesus and ability to lead his family, and accused the couple of stirring up division (a common charge from Mars Hill). “We have never again heard from any of our friends from that group,” his wife writes. All church memberships were suspended, Wisniew says, and people were encouraged to reapply under the new organizational structure, with new requirements—or quietly leave. 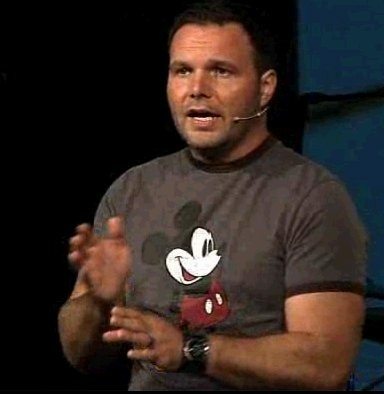 Mark Driscoll is the former pastor of Mars Hill Church in Seattle. At its peak, the church had more than a dozen locations and in excess of 15,000 weekly attenders. 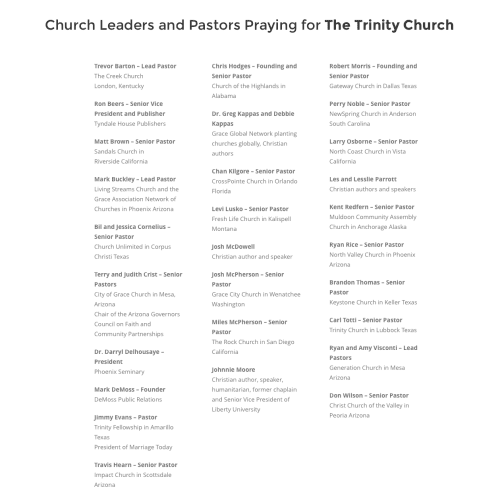 Driscoll was buddies with Neo-Calvinist hot-shots John Piper, Mark Dever and C.J. Mahaney. But in 2014, Mark Driscoll’s little fiefdom came to a screeching halt. He was accused of plagiarizing content in his books, spending more than $200,000 in ministry money for personal gain, being a potty mouthed preacher and bullying staff members. While Driscoll had already become known for making misogynistic and homophobic comments, the 2014 controversies were the proverbial straw that broke the camel’s back. Following his resignation, Mars Hill Church soon shut down. Common Christians; pew-sitters; giving-units; or rock-throwing peasants as I prefer to be labeled, have seen through Mark Driscoll for years. We knew him to be a charlatan and have repeatedly called for Christian celebrities such as those listed above to repudiate Mark Driscoll. Our pleas fell on deaf ears. Given the choice of doing the right thing or supporting a charlatan who “makes bank” the Christian celebrities choose the cash every time. Do you doubt me? Talk to Christian radio talk show host Janet Mefferd. She was the one who originally confronted Mark Driscoll on his plagiarism. As a result she faced numerous vitriolic attacks by the “respectable” Christian celebrities. Mefferd’s charges of plagiarism were factual and well-documented. They proved to be the beginning of the end for Driscoll. To my knowledge not one of the Christian celebrities has ever apologized to Janet Mefferd for the offensive way they treated her in defense of their buddy Mark Driscoll. After Driscoll became toxic he was no longer useful as a cash-cow to the manly men in the Neo-Calvinist world. Ethical icons that they are, they dropped him like a hot potato. Meanwhile, Driscoll, accustomed to the luxurious lifestyle that a $564,615 salary package (not counting conference appearance fees and book royalties) allows one to live, suddenly found himself unemployed. With his income stream drying up Driscoll quickly liquidated his $650,000 home and surveyed his prospects for future employment. It didn’t take Driscoll long to realize that his only hope of maintaining his wealthy lifestyle would be to remain in the religion business where his skill at bilking mindless Christians out of their hard-earned cash was unmatched. So the abrasive preacher dropped off the radar screen just long enough to appear repentant, yet not long enough for the Christian faithful to forget his name. No longer welcomed by the Neo-Calvinist crowd, Driscoll soon resurfaced among a different group of preachers. His demeanor changed to that of a humble, repentant man and the new celebrity preachers bought the act. Did you notice the endorsement by Perry Noble? A preacher similar to Driscoll in his demeanor, it was announced on July 10, 2016 Noble had been fired from his position due to his ongoing addiction to alcohol. 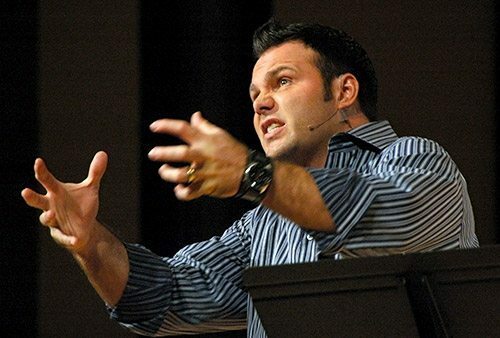 A fitting character reference for Mark Driscoll, in my opinion. I imagine that Noble will rehab his image and will be looking for Driscoll to return the favor. Check back next summer. So Driscoll, with endorsements in hand, set about surveying the country to determine a location most in need of the gospel message. After intense prayer market studies, Driscoll determined that Scottsdale, AZ was the place. Undoubtedly it was just a coincidence that Scottsdale is also one of the wealthiest suburbs of Phoenix. So Mark Driscoll, not unlike the Mormon leader Brigham Young, left Seattle for Scottsdale, hoping to find a city more receptive to his message. Driscoll held his first “gathering” for those interested in exploring the possibility of joining in his new church plant in March of 2016. With him he brought long time Mars Hill pastors Brandon Andersen and Andy Girton, along with their families. Site where Driscoll’s latest fleecing of the flock will take place. 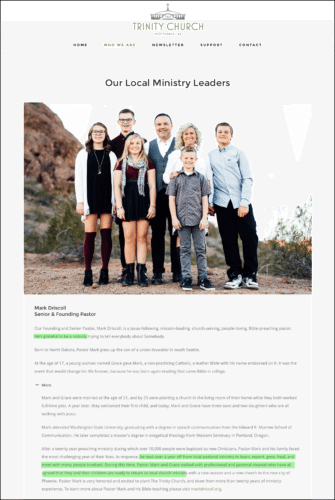 As I consider Mark Driscoll to be one of the biggest scam artists in the organized religion business, I have followed him with interest for the past several years, occasionally writing a blog post about him. It had come to my attention that a lady named Deana Holmes has been faithfully picketing Driscoll’s start-up church nearly every week since its inception. 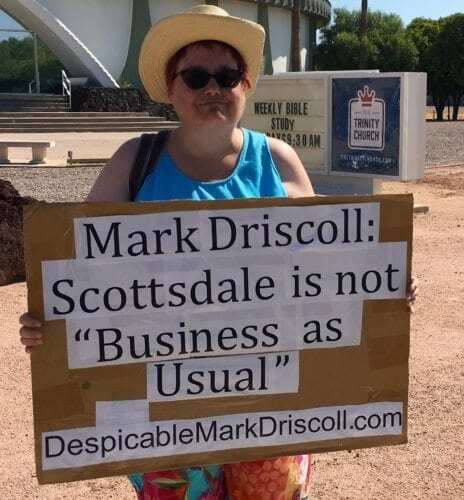 She takes her stand on the public sidewalk in front of the church every Sunday morning, holding up signs in an attempt to warn the new church-goers of the spiritually abusive past of Mark Driscoll. The curious among us wonder how a church of 100 people can support three pastors and their families, and then spring for millions of dollars to buy the church. Andersen did announce that the church was now theirs, they had a mortgage to pay and they planned on being there for many years. The whole thing seems shady to me, but hey, I am no financial expert. I will wait for the facts to eventually be revealed. (Of course there is the small matter of a lawsuit filed against Mark Driscoll and Sutton Turner, alleging, among other things, that $30 million in tithes from Mars Hill are missing.) Note: the lawsuit appears to be losing steam due to lack of money. The church service started at 0930, so I proceeded inside to observe. Deana has no interest in ever attending the service, so I left her picketing outside. I sat in the back row, with nobody else seated anywhere near me. Immediately a man who looked like a character out of Duck Dynasty came over and sat one row in front of me and then turned around and attempted to make conversation with me. I answered his questions politely, but kept my answers as short as possible. It was readily apparent that this guy was a “handler.” They had obviously seen me picketing in front of their church and were worried about my presence. His family sat on the other side of the church and at one point his young daughter came over to him and he instructed her to return to where his wife was seated. Two to three other guys stood behind me for the entire service. I later realized that two of the three were assistant pastors Andersen and Girton. Andersen started the service by making announcements up front. Of course the big announcement was about the purchase of the church. He then announced that Mark Driscoll and his family were on vacation that week, so there would be a guest speaker. That was the cue to run a video of Driscoll on the big screen up front announcing Darien Bennett, a pastor from the mega Scottsdale Bible Church, would be filling in for him. It was reassuring to hear that Mark Driscoll, who had been working hard for the past four months, was able to get away for a well deserved vacation. It was also nice to know that there was no additional stress placed upon assistant pastors Andersen or Girton to have to prepare a sermon in Driscoll’s absence. As Andersen was making his announcements I turned on the recorder I have on my I-phone and placed the phone, face up, on the chair next to me. I was able to record for a mere 29 seconds before Andersen approached me and told me they did not allow recording or photos to be taken inside of their church. I responded by asking him: “Why, do you have something to hide?” He said no, they just like to keep it among their “family.” Of course they have no family to speak of, as there are no members, the church has not even officially launched, and those in attendance are merely the curious who have yet to determine whether they want to join “the family.” Andersen then asked me if I had a problem with his policy and I stated that I did not, I had a pen and notebook and would take copious notes. Below you can listen to my short recording. As I mentioned on my Twitter account, I was left with a distinct feeling of being in the midst of a cult. I must admit I was disappointed that Mark Driscoll was not in attendance. I had wanted to ask him some rather uncomfortable questions. I doubt I would have gotten any answers, but it never hurts to remind his “type” that people are watching him. The church service was reallly no church service, and is actually billed as a bible study. There were the preliminary announcements, then Darien Bennett spoke for nearly an hour and this was followed by taking up an offering and a few more announcements requesting volunteers to teach Sunday school as well as do renovation work on the church building. They would be tearing up the old carpet that week and installing new carpet in preparation for the official church launch on August 7th. Again, it must be fantastic as a church to have such a great cash flow that you can afford new carpet! There was no music of any kind and the meeting was promptly adjourned. Curious to me was the fact that Brandon Andersen announced that the church would immediately begin with two services, one at 0900 and the second one at 1045. I read that the church can seat 1,400 people. (Driscoll just announced in the video above that they would configure the building to seat 850.) There were about 100 in attendance. Why two services? It must be a business strategy. 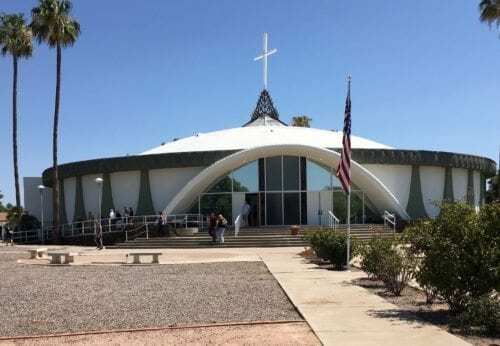 Update: Josh Green, reporter for Seattle news King 5 was in Phoenix on August 7th to report on the official opening of Driscoll’s church. Driscoll, Girton and Andersen refused to speak with Green. King 5 reporter Josh Green was also told to stay off the property. You can view Green’s King 5 story here or listen to story below. Bennett’s hour long oratory was mediocre at best. I did some research on the guy and discovered he is an assistant pastor in charge of men’s ministry at Scottsdale Bible Church. He seems like a one-trick pony. His teaching was long on his glory days of playing linebacker in college football and short on much biblical teaching. Below is a one minute video. Watch it and you will see his recurrent sports jock theme. You will also take away about as much in the one minute as I got in an hour. I wrote the following email to pastor Darien Bennett. To date I have not received a response. My name is Todd Wilhelm and I live in Dubai, United Arab Emirates. 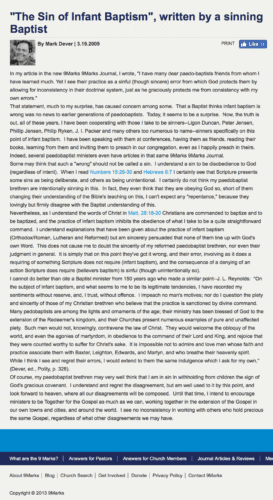 I author a blog called thouarttheman.org in which I write mainly on spiritual abuse in American Evangelical churches. On July 3, 2016 I attended The Trinity Church service in Scottsdale, AZ. My hope was to observe the church service and ask Mark Driscoll some questions. As you filled in for Mark Driscoll Sunday the 3rd, you obviously know he wasn’t there. Nonetheless, I still plan on writing about my experience and have a few questions for you which I hope you can find the time to answer. First, how long have you known Mark Driscoll? 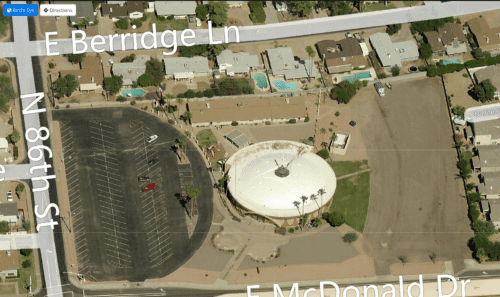 Second, was Scottsdale Bible Church staff aware that you were speaking at Mark Driscoll’s church? Third, does Scottsdale Bible Church or any of its pastors endorse Mark Driscoll’s new church or his being the senior pastor of the church? As I left the church you can see pastor Andy Girton in the door, keeping his eye on me to the very end! At I mentioned elsewhere, it is a sad commentary on American Evangelicalism when you consider there are one hundred people willing to attend a church pastored by Mark Driscoll. The heavy hitters in the Reformed evangelical world promoted him in his early days and helped him expand his audience because he was having real success with a young demographic in Seattle. His general appeal was/is similar to any other cult leader: He was a charismatic stage presence, and churchgoers didn’t really know what was going on behind the scenes. I think a lot of his young fans found his brash, controversial persona to be exciting. As for his lieutenants, people will put up with a lot of abuse when they are part of an organization that seems to be wildly successful. Note also that those who promoted Driscoll early on (despite the fact that they clearly knew about his character deficiencies) would not criticize him publicly until after his ministry had already collapsed. Thanks for the explanation, Edward! We now know how much Driscoll has in loans on the property. There are two notes, one for $2.125 million and one for $300,000. It also appears that “Glass & Garden Drive-in Church” is the beneficiary of the deed of trust and looks to be toting the note for this enterprise of Driscoll’s. Thanks for the information Deana. I appreciate all the work you do to inform the public of Mark Driscoll’s despicable ways. The link does not work anymore. Is there any way of knowing how much cash Driscoll paid out for the church? $2.5 million seems like a very cheap price for that property. I find it interesting that Driscoll is so obsessed with ensuring that his new “church” (cult) appears massive from day 1. I would reckon that the majority of new churches start very small; in fact, many of them meet in homes, rent space in storefronts, etc. Why the focus on creating an instant megachurch? Maybe so Driscoll will have an excuse to avoid any actual pastoring. Remember that at Mars Hill he had a hallway built connecting his office to the pulpit, so that he would never have to interact with the congregation. I was not aware of the hallway from Driscoll’s office directly to the pulpit! Thanks for the comment Edward. Thanks, Edward. Can you or anyone else explain the general appeal regarding Driscoll? Most of these “cult” guys have devoted followers but even Driscoll’s close lieutenants always seem to have thought/still think that Driscoll is unpleasant to be around. Thanks for the great article, Todd. I hope that everyone reading this post understands that no religious leaders in the U.S.A. have the right to use their religious beliefs as an excuse to stalk, harass, and slander others. 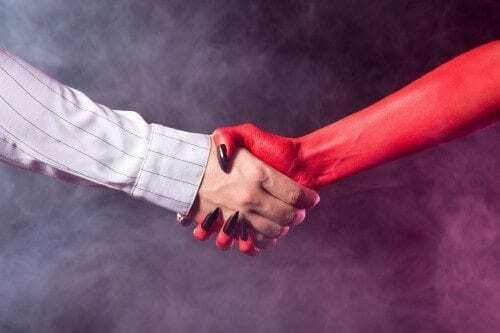 If people from a former Church/Cult are bothering you, please file a harassment complaint with your local police department and send the Church leaders a cease and desist letter by certified mail so that your complaint has a paper trail. Further, specifically, registered non-profit religious organizations in the U.S.A. have no right to issue binding “contracts” saying they can harm others by breaking the laws and/or common standards of decency held by the broader society in which they live and from whom they have no problem taking big breaks. Thanks again for the article, Todd. Todd, THAT was an encouraging clip, I had to listen to a few things twice to make sure I heard it correctly. I’ve not heard this before and am interested, thanks for pointing this out to me. Yes, very creepy. The constant intimidation is cultish, the request to not record is cultish and the pinch hitter pastor was cultish. It’s reasons like the post you wrote that I teach my family at home; it seems that all of ‘merica is plagued by this kind of ecclesiastical behavior. It’s not that I avoid any “authority”, it’s just that it must be EARNED, not expected and this is a symptom even found in the smaller churches (who use this to aspire to be a ‘big’ church…all grown up!). Back in the day (1981-87) I made a profession of faith in a Baptist Bible Fellowship church in upstate NY. The past was older and an OK guy but the ASSOCIATE was fresh out of Bible College, KJVO, Baptist baptism only, closed communion, yadda, yadda and he went either in two extremes: a tight hold on all the airbase and college people or paying attention only to his sycophants; either way you were either manipulated for the worse or ignored into oblivion and if you even thought of leaving, God would probably kill you. This attitude carried over into Bible College for me (yes, I was told if I didn’t go, God would kill me and if I left Bible College…yep, the same threat). After I came home in 1987 I went on a three year drinking binge daring God to do His worst but eventually, with the proper medication and counseling, I’ve recovered and am a gentle-Calvinist-Believer to this day (at age 55). Yup, while reading your piece, I flashbacks and became more than a little uncomfortable. Thanks for the comment Michael. It sounds like you have had an interesting journey. My journey is somewhat similar and I know there are multitudes of Christians with similar stories. 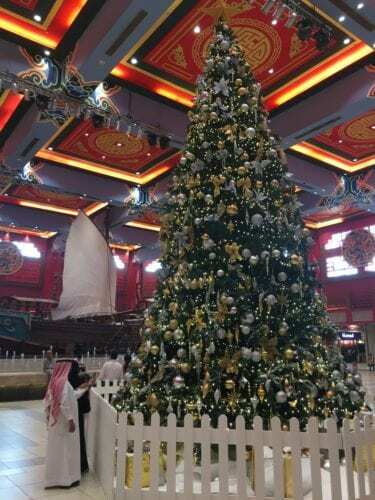 I now attend a good Anglican church in Dubai; it was a welcome relief from the madness of a 9Marx/Capitol Hill Baptist Church knock-off I had been a member of. 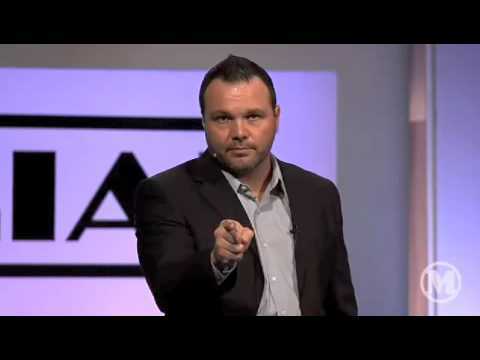 Hey Buddy!, I found this information for you: "Mark Driscoll Set to Launch His Cult in Scottsdale, AZ". Here is the website link: https://thouarttheman.org/2016/07/13/4493/. Thank you.